The only machine that combines notching and coping in one compact unit. 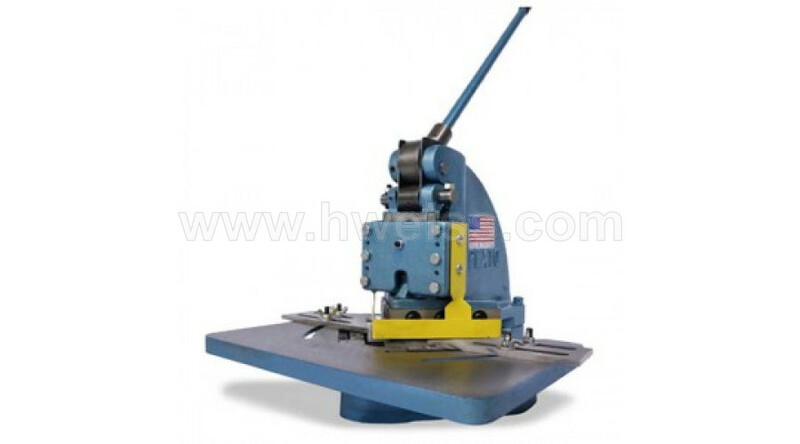 The machine may also be used for shearing strip and box corner tab notching. A machine designed to handle the many small, diversified jobs in the sheet metal shop. The PS-66 features a work table with edges machined squared for accurate and convenient gauge setting, reversible upper blades, 4-edge lower blades, and shatter-proof finger guard. No. PS-66 is a notcher coper and shear all in one. This machine is hand operated, bench or floor mounted and has adjustable gauge stops, replaceable blades and finger guards. Blades may be mounted for conventional splay cutting, starting at the outside edges, shearing to apex, or for pierce cutting, starting at apex and shearing to outside edges. Pierce cutting permits shearing inside the blank and coping. The PS-66 can cut a full 6? x 6? corner notch in one stroke. Saves the 6? x 6? cut out blank. By removing one frame bolt, the PS-66 will shear or square 6? material of any length.